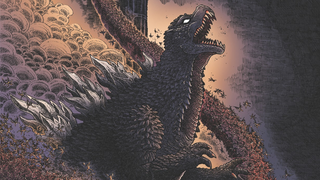 Godzilla's visited some strange locales over the last half-century of Kaiju shenanigans, but now IDW Comics is taking him someplace entirely new: Hell itself. Aptly titled Godzilla In Hell, the miniseries will see writer and artist James Stokoe return to the character for the first time since 2012's Godzilla: The Half-Century War. The premise is actually a mystery: The King of Kaiju finds himself sent to Hell by an unknown force, and must discover who sent him there, and why (I'm going to hazard a guess that it's probably something to do with all those citizens you've munched on/squished/atomic-breathed-to-death over the years). Of course, this also means that Godzilla will have to go toe-to-toe with the demonic monsters that inhabit hell along the way. Which sounds awesome. I mean, what's not to love about a) Godzilla getting his thinking-cap on and solving a mystery and b) fighting monsters through hell. Between that idea and Stokoe's excellent art, you can't help but be outlandishly excited for such a thing. Godzilla In Hell will run for five issues, and begins in July.